Everyday I see new ideas every where I turn. If it is not a new thread, it is a new machine, if it is not a new design use, it is a new stabilizer. Here is an idea that I thought was really great. Combining ruching with embroidery to create a three dimensional item. Here is the photo of the finished project and then I will apply the same idea to my own take on the idea. 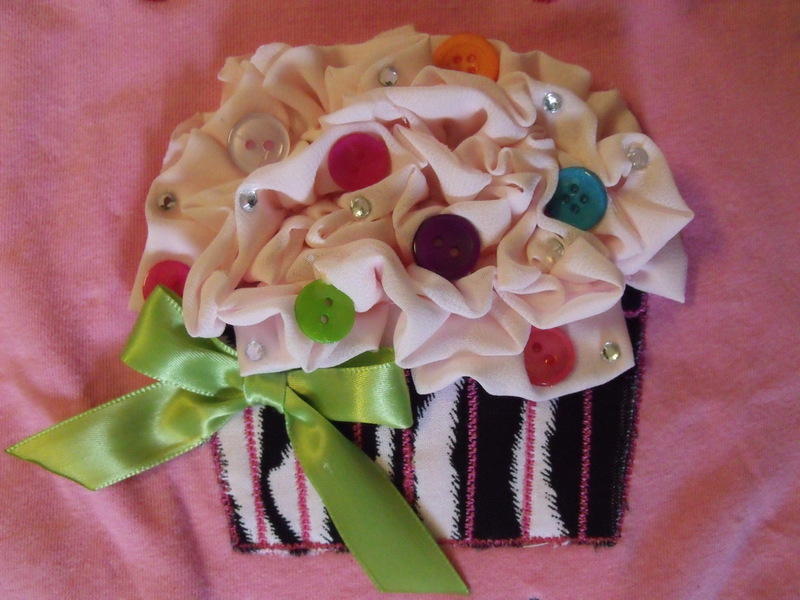 This is a really fun way to create a one-of-a-kind item for a little girl or even an anniversary item. 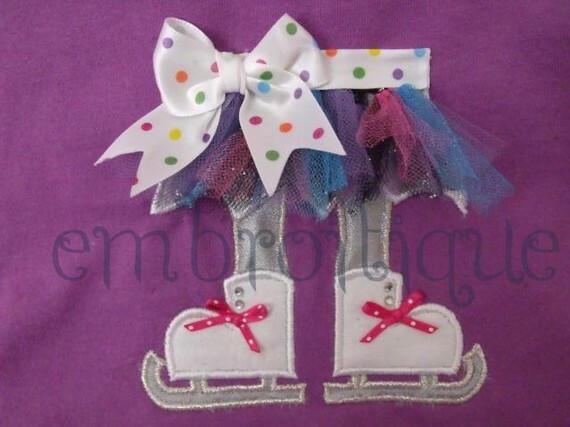 I think that the idea can be translated into any other design that you might have that is an appliqué or a space for putting the ribbon in place. I am using a rose that has been a favorite of mine for a long time. It is simple and yet very detailed. 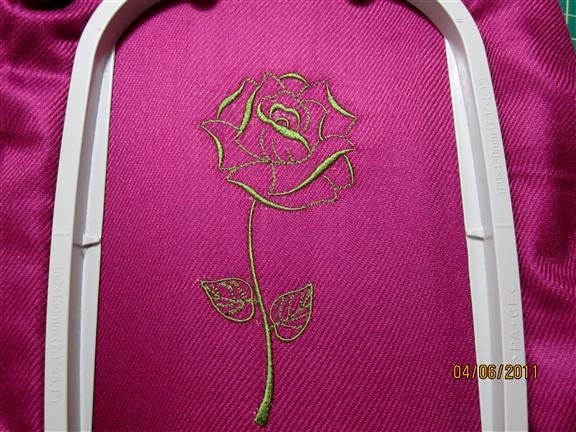 I embroidered the design with the knowledge that the rose would be covered. I hoped to be able to match the curves of the rose and with a little practice, I think I could. However, that was too difficult to try for this first attempt at the use of ruching. Next I looked through my stash and found some gold lame (pronounced la may) that I had left over. There wasn't much of the material, but with lame, a little goes a long way. Whatever you chose to use, you need to be sure you have a way to 'set' the edges. In this case, I used the 'heat seal' method. You use a lighter or matches and gently touch the edge you want to seal. 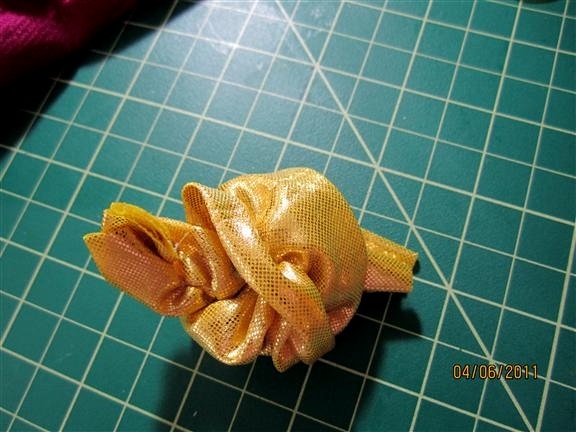 Try this on ribbon, fabric or anything you want to seal. It is surprising how easy it is to seal the edge. If you touch the edge, it cools quickly, you will feel an edge so that you know your fabric will not ravel. According to the directions given in the design by the digitizers, use a piece of fabric about 4" by about 10" and fold it in 3 sections. 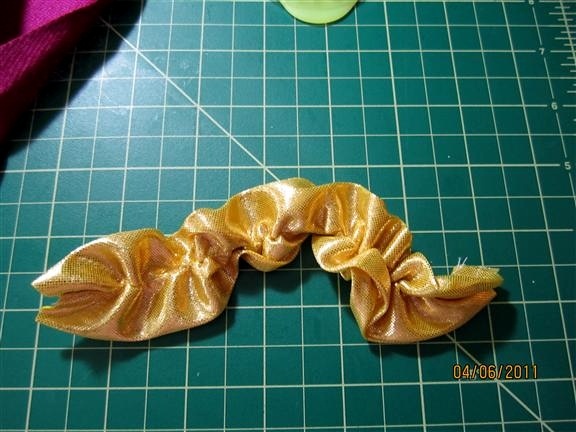 I then basted that and created a ruffle. All I did after that was to make a lose know in the lame. How easy is all of this so far?? A few well placed stitches to hold it securely and I was done. Since the lame keeps its shape, I can put this rose on nearly anything like a tote or t-shirt or anything that does not eat or move. 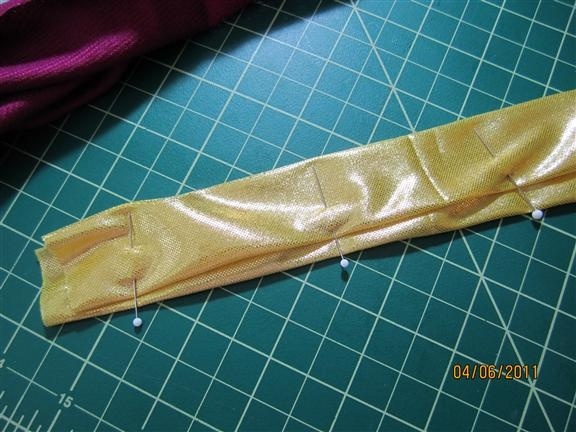 You could use thin to wide fabric or ribbon to create different looks. A thin, gathered ribbon in the middle of a sunflower would be great. You could make the piece of fabric as long as you like. 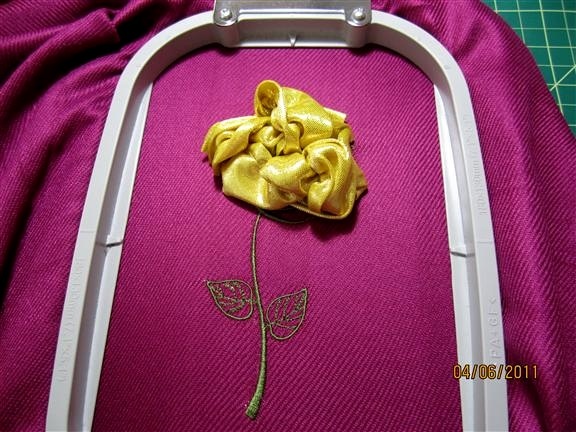 I have seen others make ribbon roses and rosebuds, that would be a great addition. 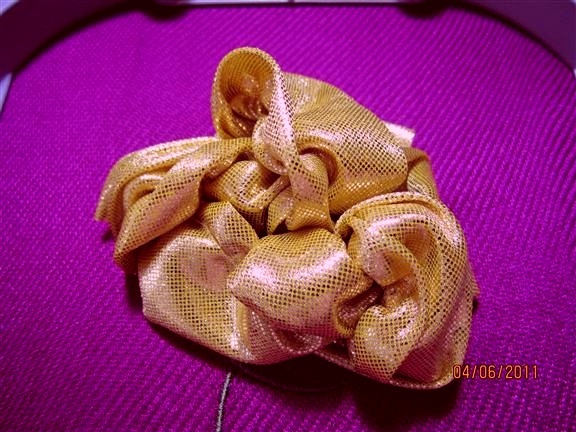 How about using it on a design on a tote and then cover the straps with the ruffle? You could use multicolor (or multi pieces) of different fabric and have a crazy quilt type of look. You can add embellishments like the designer did in the top photo. You could use this for grass on a landscape scene. This would be great to use for sunshine. I think the ideas are endless for one of a kind items. I would love to hear what you might or did use this idea with. This is a unique idea. I have some gold lame left over from a 50th birthday party, so I will experiment with this, and also some green, similar type. It is fun to find a way to use some old piece of fabric. I really hope someone will take some quilt scraps and create a long ruffle using multiple pieces of divergent fabric. How cool would a flower of many colors be? If you do so, put a photo in the Forum and return and tell us about it. I just don't have the wonderful items a quilter would. I like the rose as well!! where it comes from ? Susan - I love that rose! I must have used it a dozen times already and it was a FREEBIE! I wish I could remember where I got it. . . It is inexpensive and really great. Terrific idea, gets the creative juices flowing. Thank you. Thank you Maureen - That is why I do this blog. Believe me, I am no expert but I do like to find unusual things to bring to you and me. Welcome - from southern California, USA. Thank you. What a lovely way of using some left over material and still create a master piece. I love your new rose. Susie.